For the second installment of my Aging Project I am looking at a mild Cuban smoke, the Fonseca KDT Cadetes. In general the predominant wisdom on cigars is that medium and full-bodied cigars age while mild ones simply tend to go flat. Yet, as I mentioned in the Por Larrañaga post, for certain mild Cubans you find that experts suggest a few years of aging to bring out their full potential. The Fonseca KDT Cadetes fit the profile of a mild cigar nicely and at the same time I must admit I am slightly cheating here: I have had a few of these with 3-4 years on them and they can be very nice cigars, dominated by nutty notes, cocoa, a little spice and mild honey sweetness. The box I will be following while it ages is from November ’08, so younger than the KDTs I’ve had in the past. It will be interesting to see how these yonger cigars measure up. The other reason for choosing these is more personal. 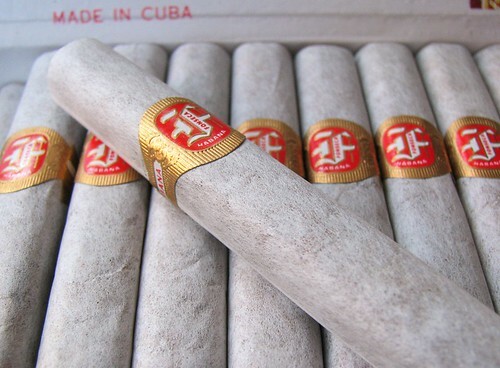 Personally, I think Fonseca is a much overlooked Cuban brand. The reason for this is probably a combination of many seeing this as a beginner’s brand and the fact that, unlike most other Cuban brands, the Fonseca cigars play more around mellow flavours instead of showing the powerful profile most people identify Cuban smokes with. While these certainly make good beginner’s cigars, in the best cases they are very nice light refined smokes and not expensive either. In my experience the No.1, a Lonsdale, is probably the best expression of what Fonseca cigars can deliver while the Cadetes are a simpler smoke, but still not without complexity. 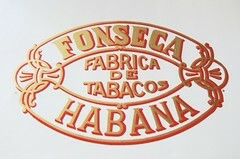 Too bad Habanos has discontinued the Fonseca Invictos in 2002, a perfecto looking like an inverted torpedo (for a picture see Trevor’s Cuban Cigar site), which from what I have read not only had a cool looking shape but also was one of the best Fonseca Vitolas: I would have loved to try one of these. Price: You can find these on-line for as little as 60-65$ for a box of 25, making them some of the cheapest long-filler Cubans out there. In the UK they go for 120£ or more. As with all Fonseca cigars, these come wrapped in rice paper. Some people (me included) find this an old-fashioned but lovable idea, others hate this. There are many different stories trying to explain why Fonseca cigars use this quaint packaging, but the one that makes most sense to me is that apparently the rice paper was introduced to protect the cigars during transport some time before the spread of cellophane, which was used in Cuba starting from the 30’s. Whatever the real story might be, I think this extra paper has a great advantage: becaue it is placed below the band, it protects from wrapper tears when removing over-glued bands, something not unusual with Cuban cigars. Still, that is all packaging. The Cigars themselves, once “undressed” have a light reddish colorado wrapper, a nice triple cap but not a lot of sheen. Of the three cigars I smoked, two had small watermarks in a couple of spots, but nothing major. Although this cigar has been in my humidor for about 6 weeks it feels slightly dry at the touch, but has no soft ot hard spots. Once cut the draw is slightly tight, but not so much as to make these hard to smoke, and has faint sweet spice and cocoa notes. The draw is a little snug for the first five minutes or so, but then opens up letting up a decent but not huge amount of smoke. On the other hand the burn is perfect for 15 minutes but then canoes and needs some occasional correction. 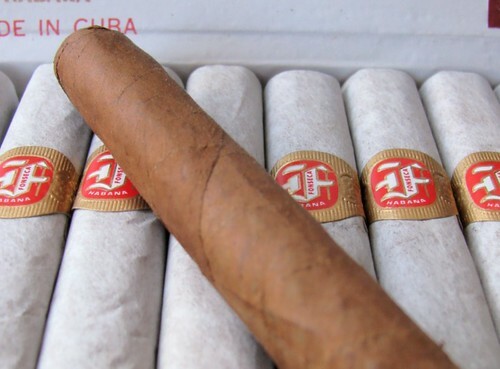 According to some Cuban cigars need 2 years of aging to burn properly and that might explain the issues. The ash is a dark gray and stays on for pretty long. This starts in true Fonseca fashion with nutty notes (hazelnut maybe?) cocoa and an unusual but not unpleasant salty taste. The finish has a slight pepper spice but is neither strong nor particularly long lived. All in all the flavours complement each other very well and are very balanced. Through this section there is a bit of sweetness and a light cedar note that progressively increase towards the middle. I have no clue what is happening with the cigar but after a very short phase where wood dominates this turns into pure… crap. I am not sure if I can describe the taste well enough but thing of a heavy, lingering overcooked vegetables smell and you are quite close. There are other notes trying to come through (wood again, earthy notes and some sweetness) but they are just overpowered. Really not impressed. Things get a bit better towards the end. Although the are are still hints of the “overcooked ” taste, the cigar gets back on track and is woody with some hints of honey and earth. Still a bit rough but not too bad. Although the first part of the cigar, and to a lesser extent the end, were as i would expect a good KDT to be, the central part of the cigar was such a complete disappointing mess that at the moment I certainly wouldn’t be advising anyone to smoke these. Although I scored the three cigars I tried between 76 and 77 they felt like less than that. It will be interesting to see how these smoke in six months time, especially to see if that “cooked” taste disappears and start to become like the KDTs I loved in the past or if I have had the luck (irony here) of picking a poor box. This entry was posted in Aging cigars, Cigar Reviews, Cuban and tagged Cigar Review, Cuban cigars, Fonseca. Bookmark the permalink.